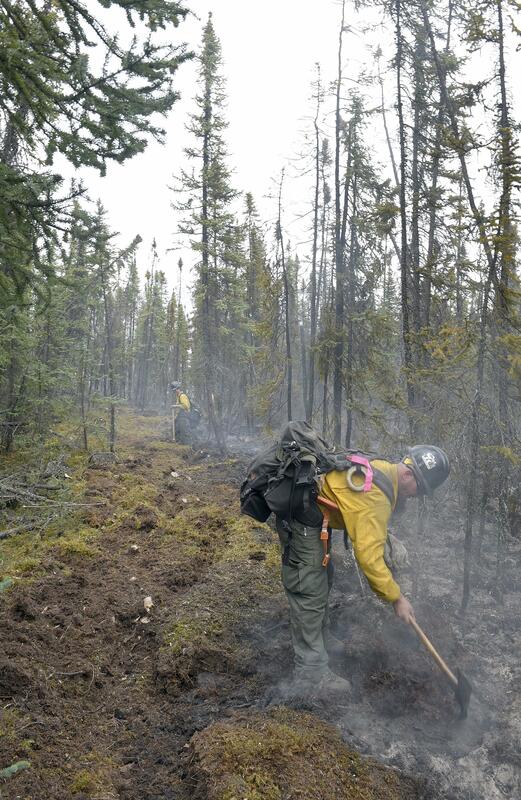 Firefighters continue to gain ground on a wildfire burning along the Alaska Highway near Tok. 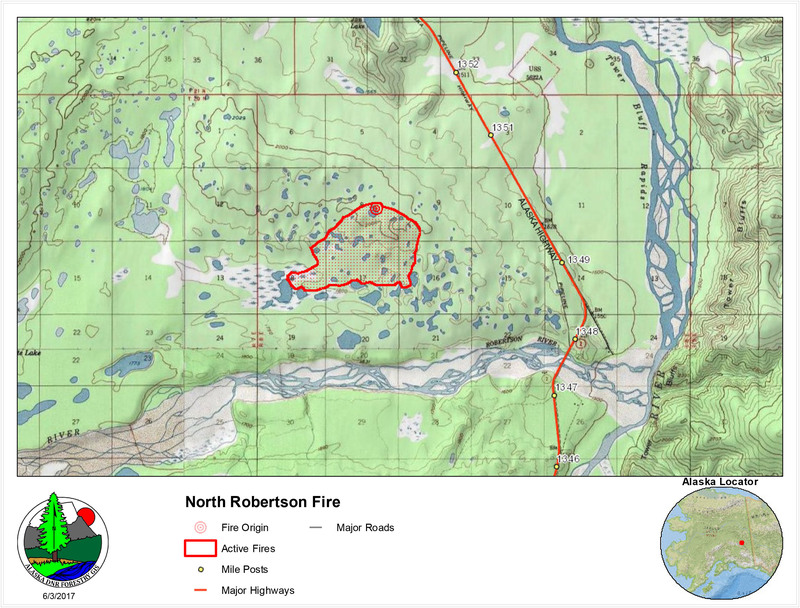 As of Saturday morning, the North Robertson Fire approximately 30 miles northwest of Tok was estimated at 1,036 acres and was 10 percent contained, according to the Alaska Division of Forestry. There are 204 personnel working on the fire. The fire is burning approximately 2 miles west of the Alaska Highway and 2 miles north of the Robertson River. The highway remains open but smoke is visible from the road. Motorists in the area should use caution and be on the lookout for firefighting equipment and firefighters on the road. The human-caused fire was reported as a small blaze late Thursday morning near Milepost 1350 of the Alaska Highway and it grew rapidly to an estimated 800 acres by the end of the day due to warm, dry conditions. The predominant fuel type is black spruce. Fire activity moderated significantly on Friday with cooler temperatures, high relative humidity and cloud cover. The eight 20-person crews and 16 smokejumpers working on the fire were able to make good progress cutting and building fire line on the east, north and south flanks. Similar conditions are expected today and crews will continue to cut and build containment lines around the entire fire perimeter with saws, pumps and hose. Fixed-wing, water-scooping aircraft and helicopters will continue to drop water on active portions of the fire on the west flank to prevent potential spread until crews begin building containment line on that side of the fire. Crews from the Alaska Division of Forestry and BLM Alaska Fire Service are working on the fire and another initial attack crew from the U.S. Forest Service will arrive today to bring the total number of crews working on the fire to nine. There are also 16 smokejumpers from the Alaska Fire Service working on the fire. A map showing the perimeter of the North Robertson Fire burning near Milepost 1350 of the Alaska Highway. The fire was estimated at 1,036 acres as of Saturday morning. There are some homes and recreational cabins to the north and west of the fire but the closest structures are about 2 miles away. No structures are immediately threatened by the fire, according to fire managers. There is a temporary flight restriction in place over the fire and pilots should check with the Federal Aviation Administration before flying in the area. More information on the TFR is available at http://tfr.faa.gov/tfr2/list.html.